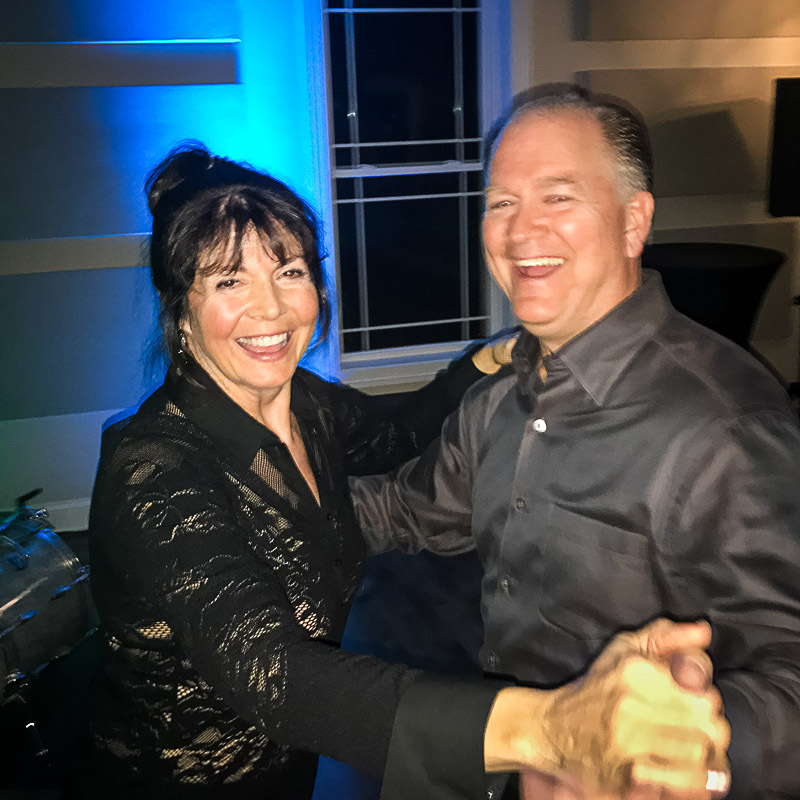 Lori and Mike Lyman took to the dance floor in support of the Long Grove Arts and Music Council at the March 10th Jazz & Dance Fundraiser. The transition from winter to spring is a long and drawn-out process in our part of the Midwest. Each day we are gifted with a few more minutes of sunshine to enjoy, but our gardens and open spaces remain brown, drab, and lackluster. One week we are seduced to leave the heavy coats behind as the promise of warmer weather beckons, only to have another round of sub-freezing temps and snow flurries slap us with a reminder that, in fact, winter is still in charge. Setting our clocks ahead one hour this morning is another positive indication that a new season is on the horizon. 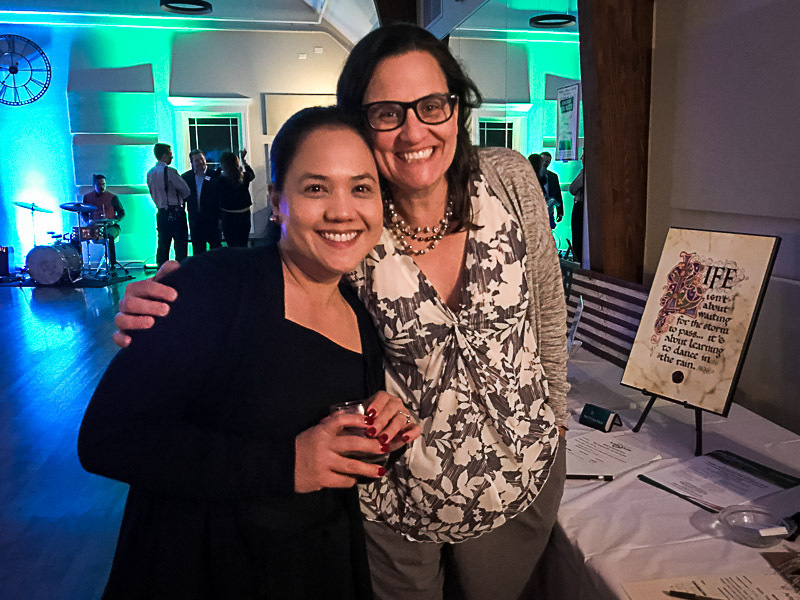 The Long Grove Arts and Music Council provided a great opportunity last night to enliven yet one more cold and dreary winter night in the best possible way–with a Jazzy array of food, music, dancing, friends and philanthropy. To raise funds and excitement for the 2018 Summer Concert Series, a benefit was held at the newly opened Fred Astaire Dance Studio in Long Grove. It was heartwarming to see the many donations local merchants and residents provided for the silent auction. A live jazz band was on hand to provide upbeat entertainment, as supporters and council volunteers mixed and mingled and generally enjoyed the congenial atmosphere. To me, it was another encouraging example of the revitalization efforts in our historic downtown these past several years paying off. Long Grove residents now have many options to come together and socialize locally, and in the case of last night, to also support a group that provides free summer concerts benefiting the broader community at large. And despite the current reluctance of winter to give way, it’s enough to put a little spring in my step! Ethel Robey-Berger, Arts and Music Council Artistic Director (on the left) and Mary Prekop of the Long Grove Confectionery check out the bidding competition on the silent auction items. Some of the Long Grove-Kildeer Neighbors and Newcomers Club members (L to R) at the September 12th Brunch: Sandy Yogendran, Renee Clark, Katie Hodge, Susan Fasano, Lana Pollard, and Angie Underwood. Today I’d like to highlight one community group that is near and dear to my heart and continues to be a force for good in our village. 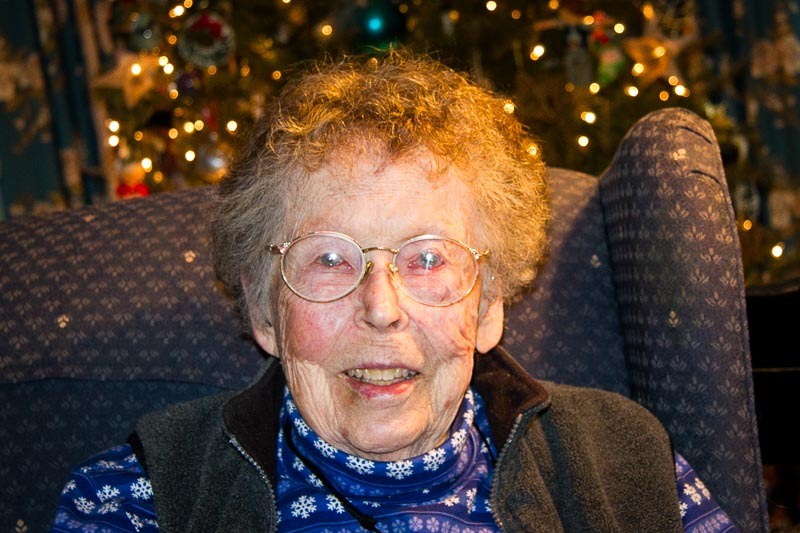 Founded in 1957, shortly after the Village of Long Grove was incorporated, the Neighbors and Newcomers Club of Long Grove and Kildeer has been welcoming new residents and sustaining friendships for 50 years. 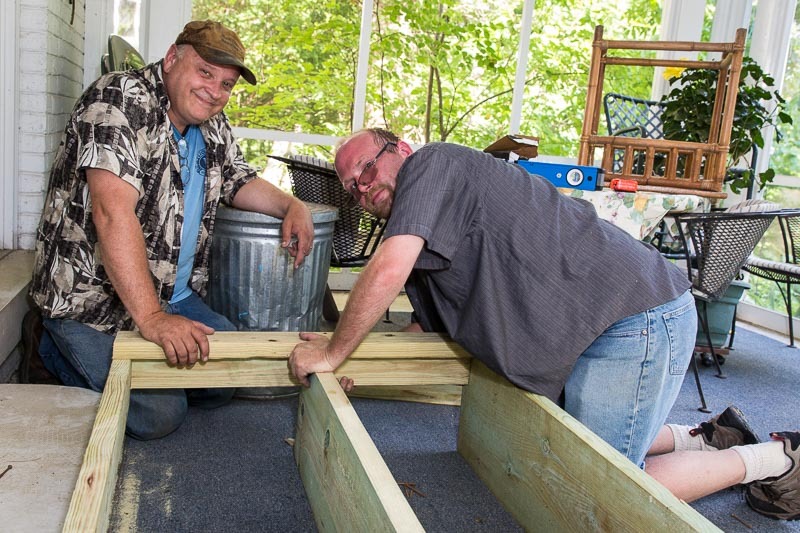 This vibrant group has helped countless residents get acclimated into their new communities and fostered social connections that have lasted in some cases, decades. I was introduced to this group 20 years ago when we first moved to the area, and quickly met other newcomers like myself who shared similar interests and had children the same ages as my own. Some of the ladies pictured above I have known since I joined, others are more recent friends. I have had the pleasure of serving as President of this wonderful group three separate times over the ensuing years. Earlier this month was the fall “kick-off” event, a brunch at our current President’s home in which we welcomed three new members and had fun catching up on summer happenings with long-time friends. Everyone who attended brought donations of toiletry bags filled with essentials (shampoo, toothpaste, deodorant, lotion, etc…) to be donated to WINGS, a local Safe House for women and children fleeing desperate situations. Each year the club sponsors one specific collection for a local charity. In past years the donations have ranged from food for the local food pantry, children’s pajamas for a shelter, toys for a holiday gift drive, and the adopt-a-family program through Vernon Township. One way to really get to know your neighbors is through a shared interest. Here is where this group really excels, by offering eight different interest groups in which you can participate in, as little or much as you choose. My personal favorite is the Grove Trotters walking group, which meets at Heron Creek Forest Preserve or other neighborhood walking trails for fellowship and fitness in our beautiful Long Grove & Kildeer open spaces. You can participate in an evening book club, Bunco/Game Night, couples Wine Tasting or Gourmet dining, Out to Lunch with the ladies or take in a Chick Flicks show at a local theater. If social opportunities are what you are interested in, look no further than this friendly club. For more information please visit the Facebook page here. As I mentioned earlier, I have a great amount of affection for this group. I liken it to the song I learned back in Girl Scouts, “Make new friends, but keep the old, one is silver and the other gold.” The friends I have made over the last twenty years in Neighbors & Newcomers are truly golden. 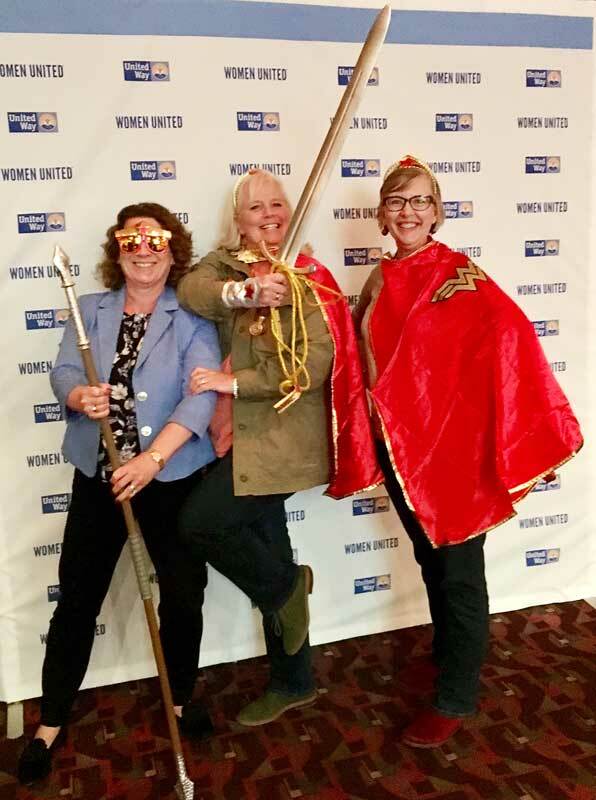 Having fun with the ladies and supporting early childhood education at Power of the Purse: (L to R) Lori Lyman, Village of Long Grove Trustee, Kristi Long, President and CEO of United Way of Lake County, Angie Underwood, Long Grove Village President, and Patrice Maloney-Knauff, Women’s Leadership Council Co-Chair. What woman doesn’t love a beautiful new purse? I’m pretty excited about the one I recently acquired at this year’s Power of the Purse event. 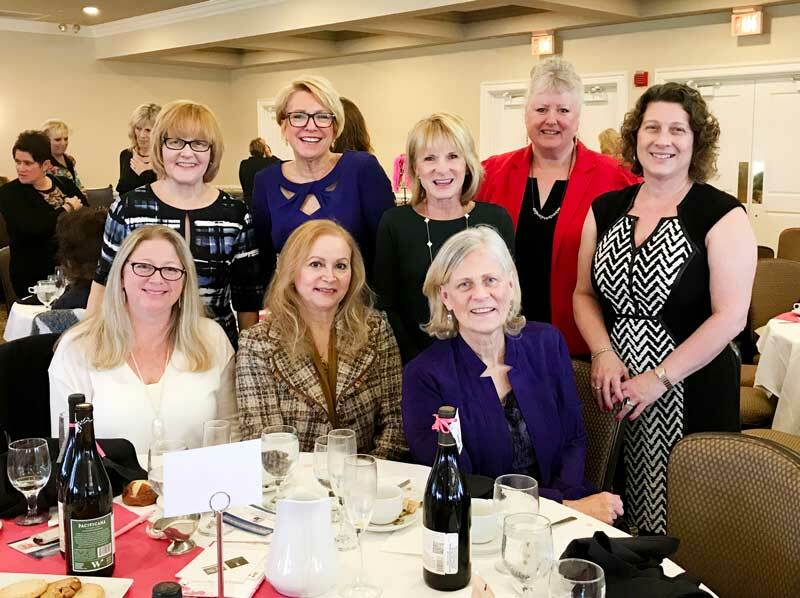 Held at Royal Melbourne Country Club in Long Grove, this luncheon celebrating women, friendship, and philanthropy is the major fundraiser for the Women’s Leadership Council of United Way of Lake County. 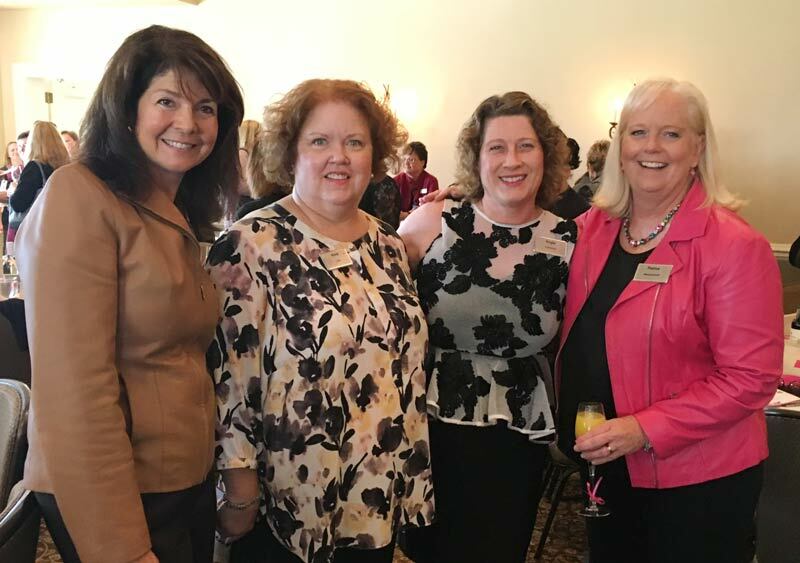 As a member of the WLC, I was delighted that our Village was chosen to host the event this year, and I made sure to pull together a table of Long Grove ladies who are passionate about getting our youngest Lake County residents ready to succeed in school and in life. During my year and a half involvement with the WLC, I have been impressed by the support given both financially and in volunteerism to provide opportunities for low income children to increase their literacy. I’ve gotten to share a favorite Dr. Seuss story with preschool students at the Green Bay Early Childhood Center in North Chicago, and help establish their new Infant Toddler Community Resource Center. This summer at a meeting in our Long Grove Village Hall, I got to meet the grant recipients of our “Little Kids, Big Futures” Philanthropy Fund. 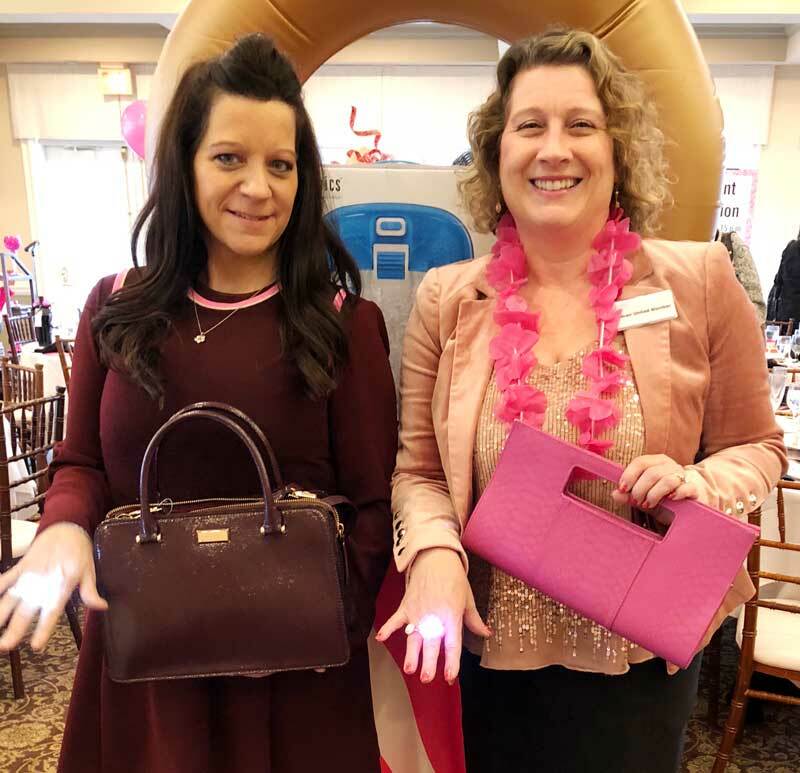 Programs such as Success By 6 and Kindergarten Countdown Camp are possible as a result of the monies raised at Power of the Purse. So about that new purse that I purchased–I had to act quickly to pick it out, sign my name on the pledge card and pop a balloon before several other women who were hot on my heels scarfed it up! 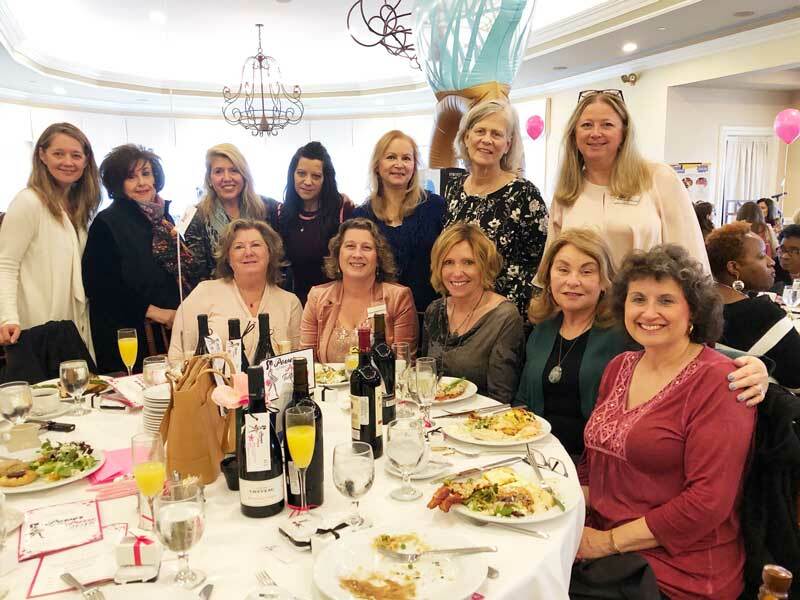 There were games to be played, raffles to win, silent auction items to bid on, books to be dedicated and a delicious lunch to enjoy with friends. It was great fun to join with over 200 other ladies to spend an afternoon shopping, socializing, and making a positive impact in children’s lives. Lake County Board Representative Craig Taylor (on the right) shows off his vintage car to Aaron Underwood. Earlier this month I was pleasantly surprised by an event in our historic downtown that I attended by happenstance. On Sunday, July 10th a group of volunteers gathered at the Historical Society farmhouse to do some needed painting, and over the course of the morning as we worked, we watched the Stempel parking lot slowly fill with nearly 100 antique and vintage cars. As it turned out, downtown business Neumann’s Cigars and More had partnered with the Village of Kildeer Police Department to host a car show and fundraiser that attracted an estimated 1,000 people enjoying the beautiful summer day. Besides checking out all the cool cars, the event featured music, food, raffles, awards, and a demonstration by the Lake County Sheriff’s Office K-9 unit. With so many interesting and unique cars on display, we could not help ourselves from wandering over to investigate. My husband was like a kid in a candy store! 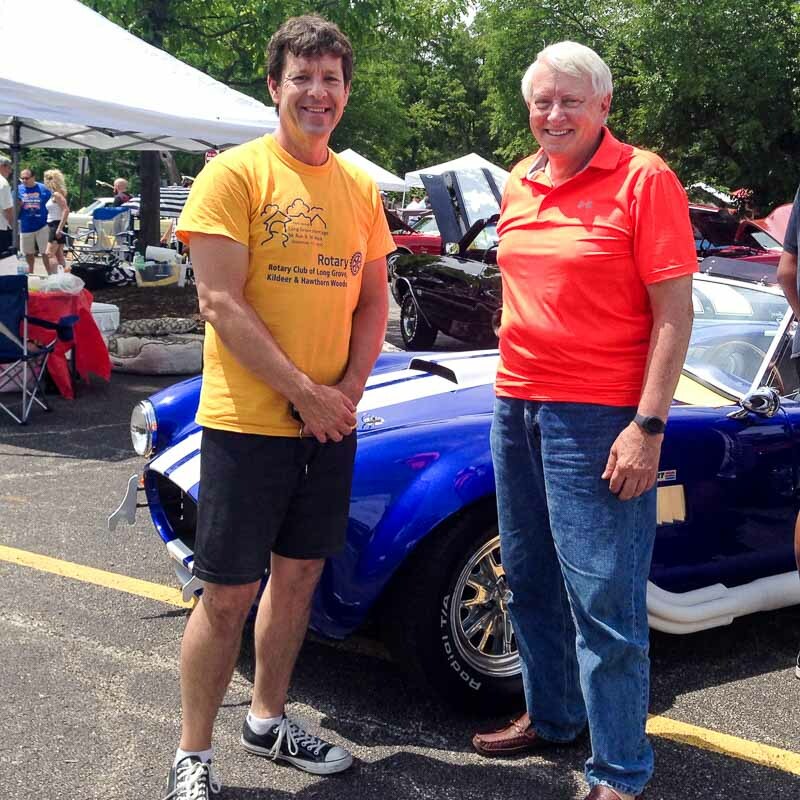 The “Cars and Cigars” fundraiser collected over $15,000 to benefit Illinois Special Olympics, and while Aaron was ogling the sweet rides of the past, I had a chance to chat with the organizer of the event. Kildeer police Chief Steve Balinski launched the fundraiser five years ago while working with the Buffalo Grove police department, and continued the tradition when he made the move to Kildeer. I love the teamwork of volunteers from two of our neighboring villages coming together with a Long Grove business to host such a fun and successful afternoon, all to benefit a worthy cause. I’m so glad we were in the perfect place to see this real-life “hot wheels” collection come to life!